Moxtek turns to DDA Video once again to produce a trade show video with rich 3D animations that reflect the exquisite beauty of the colorful light produced by their new polarizing beamsplitters. Moxtek had recently developed two new polarizing beamsplitters to its product line: the wire-grid PBS plate and the exciting new ICE Cube™, which combines the wire-grid PBS Plate with two glass prisms, allowing optimization of the unit for either high Index, Contrast, or Efficiency. Moxtek had worked with DDA to produce an advanced trade show video with 3D animation earlier in 2012, so they knew that they could trust the company to produce something really special to flesh out their marketing materials on the new products in a timely fashion. This time around, DDA would develop a significantly longer video with an even greater level of detail to the 3D animations than had been done in the past, while still carrying over the basic design aesthetic from the previous video and using the same voice-over talent to ensure continuity between the two. Moxtek wanted to make sure that the 3D animations would capture even the most minute detail of the PBS plate and the ICE Cube: for example, the client made it very clear that the two wedged prisms that are included in the ICE Cube would not be symmetrical, as this arrangement played a critical component to how the design functions. Not only would the PBS plate be portrayed, but the video would also feature a microscopic view of the plate to show its unique construction in addition to a short 2D animation to demonstrate how the plate works to split and polarize light. Moxtek also wanted to contrast the PBS Plate and the ICE Cube to a popular product from a competing company so that people could clearly understand the superiority of Moxtek's solutions for polarized beamsplitting. Finally, Moxtek wanted to make sure that viewers of the video would understand not only the best uses of the products generally, but real-world examples of the products' use in specific applications. DDA began working on the video immediately following client approval of the project to ensure timely delivery for the upcoming trade show. DDA made some modest updates to the video design to modernize the aesthetics and utilized a variety of client-provided imagery that helped to explain the products in further detail. DDA refined and animated this provided imagery to increase its visual impact and modified some visual resources shared between the two videos to help maximize the amount of work accomplished with the budget provided for the project. On-screen texts were placed alongside product and other imagery to bring out key takeaway points on the various themes of the script. DDA animated the ICE Cube over an image of a head-mounted display (HMD) to demonstrate its application in products such as Google™ Glass, and the video featured a segment showing a Head-Up Display (HUD) in the cockpit of an airplane to indicate both products' suitability for these types of applications. 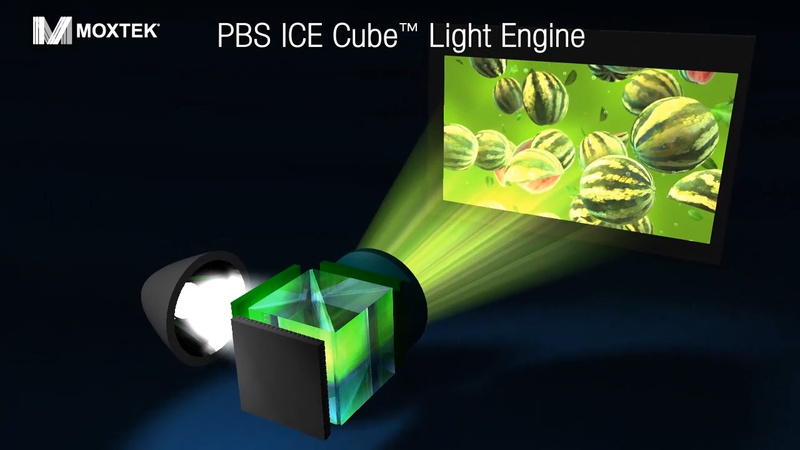 At the heart of the video lay three breathtaking 3D animations, one demonstrating how the two asymmetrical wedged prisms surround the PBS plate to form the ICE Cube, and the other two showing the PBS Plate and the ICE Cube in a working light engine as it projects gorgeous, colorful video or animation. These animations demonstrated the actual light path through the light engines equipped with the Moxtek products so that the viewer would have a perfect understanding of the functionality of these devices, with pure white light going into the polarizing beamsplitters and lush, colorful light projecting out of the light engines to a screen ahead of them. The completed video had a run time of slightly over four and a half minutes and was mastered on DVD as well as being transmitted to the client on a hard disk drive. As extensive as DDA's work on the videos was, the process was so efficient that there was room in the budget to create a couple of shorter alternative versions of the video for different marketing purposes, one with a run time of 2:30, and the other with a run time of 1:37. Moxtek had all versions in hand as they left for their trade show, with the bulk of the videography work on the project being completed in a roughly five-week timeline. The final full-length video was very well received by Moxtek, as were the short and teaser versions of the video created to serve other audiences and purposes. Now Moxtek has in hand an even more dramatic presentation of their advanced polarized beamsplitting technologies to demonstrate the unique value proposition offered by their product line. Plus, the gorgeous and incredibly detailed 3D animations with striking lighting effects help to reflect the beautiful results of deploying Moxtek's technologies in various light engine applications and will serve the company well into the future.